Welding of aluminium; Welding metallurgy; Material standards, designations and alloys; Preparation for welding; Welding design; TIG welding; MIG welding; Other welding processes; Resistance welding processes; Welding procedure and welder approval; Weld defects and quality control. It is intended as a practical guide for the Welding Engineer and covers weldability of aluminium alloys; process descriptions, advantages, limitations, proposed weld parameters, health and safety issues; preparation for welding, quality assurance and quality control issues along with problem solving. The book includes sections on parent metal storage and preparation prior to welding. It describes the more frequently encountered processes and has recommendations on welding parameters that may be used as a starting point for the development of a viable welding procedure. Included in these chapters are hints and tips to avoid some of the pitfalls of welding these sometimes-problematic materials. The content is both descriptive and qualitative. The author has avoided the use of mathematical expressions to describe the effects of welding. 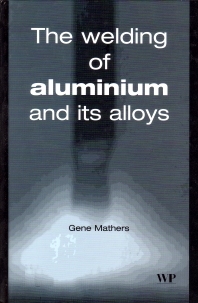 This book is essential reading for welding engineers, production engineers, production managers, designers and shop-floor supervisors involved in the aluminium fabrication industry. Gene Mathers is currently employed as a Welding Engineering Consultant at TWI. He formerly held the position of Head of the School of Welding Technology at TWI and has had more than 30 years experience in the welding industry, mostly in heavy engineering and power generation industries in welding engineering and quality management.